So I’ve been trying to balance out the sugar with reasonably healthy things. Like soup. 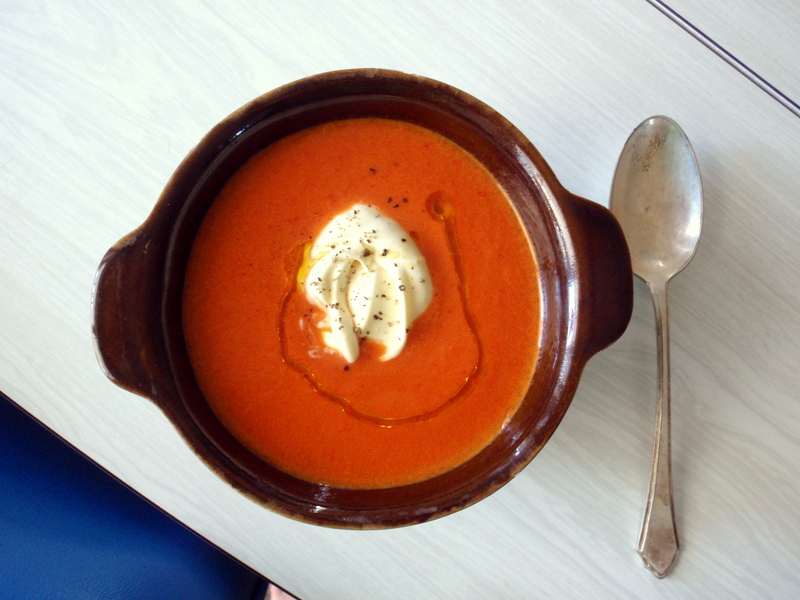 I know I’ve been whining about the end of summer for the last few blog posts*** but I’m actually harbouring this secret excitement for cooler weather and autumn (I won’t dare say I’m excited for winter, but close enough) and SOUP. The recipe is from this book my mum got me called Cooking School Secrets for Real World Cooks. It’s full of consistently accessible (and good!) recipes and informative sidebars full of tips and tricks but no photos, which is somewhat unusual for cookbooks these days but, you know, all good. 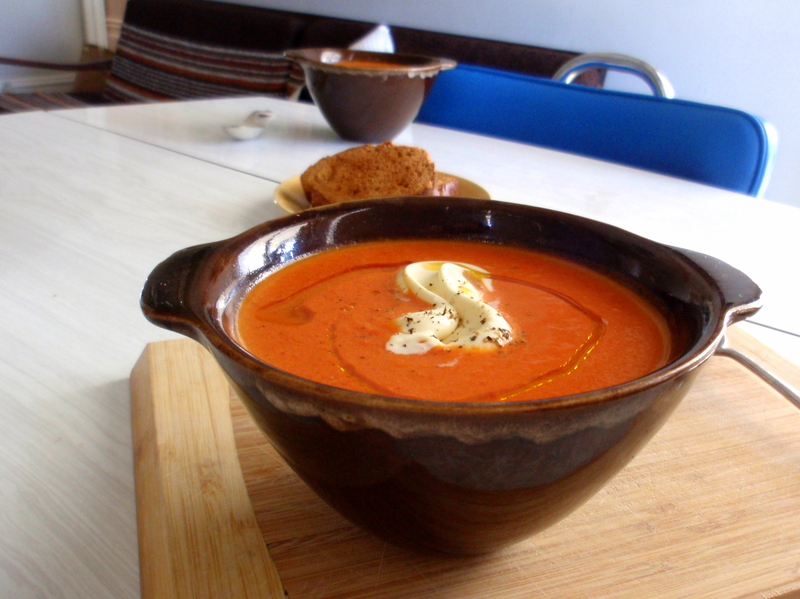 It’s been one of my favourite cookbooks over the years and this is one of the first recipes I ever made from it. 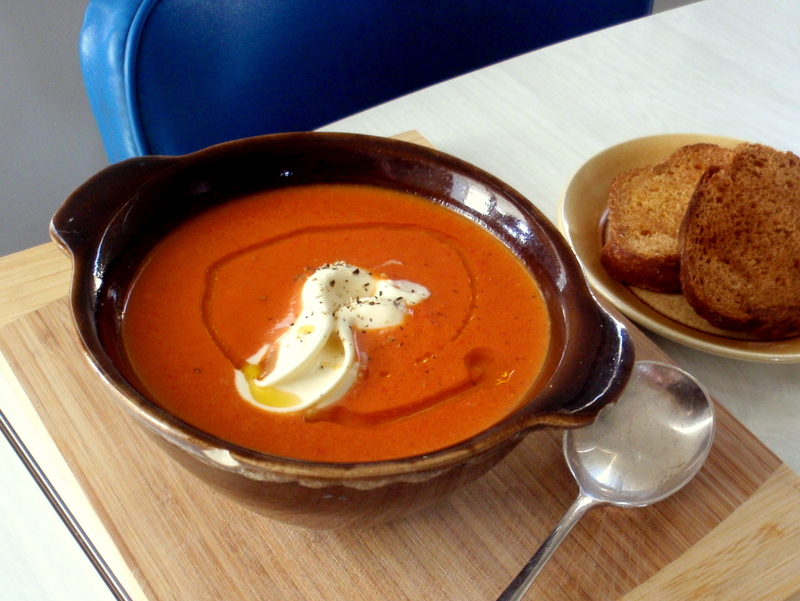 Though the page is dotted with bright orange splatter-marks I hardly need to look at the recipe anymore, it’s so simple: red capsicums cooked with the holy trinity of carrot, onion, celery, plus a bit of cayenne pepper for heat and a bit of cream for… creaminess. 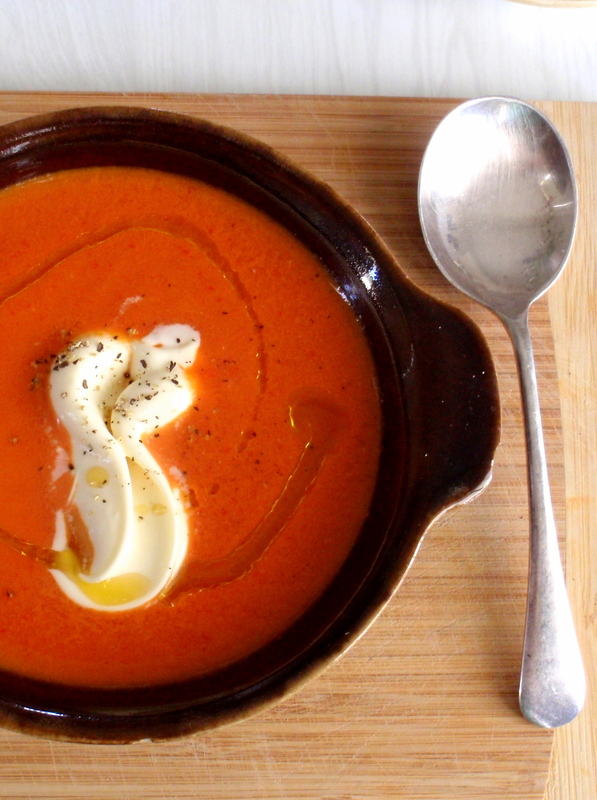 You don’t really need to think much while making this, which makes it the perfect recipe for getting back into the soup groove. *Dessert for dinner is still awesome though. **I am going to start over this week, er, well, after the waffle breakfast we’re having at work tomorrow! ***although summer is clearly still not over, seeing as I’m typing this sitting on my balcony, no sleeves, bare feet. Heat 3 tbsp olive oil in a decent-sized pot over medium-high heat, add the onion, carrot and celery and saute for several minutes until the onion is soft and translucent. Add 1/4 tsp cayenne pepper and the capsicum, give it a good couple of stirs and let the capsicum cook for about 5 minutes. Add the chicken stock (you may not use the whole litre, the idea is you want enough stock to cover all the vegetables in the pot). Bring to a boil, reduce heat, simmer about 30 minutes. Add 1/4 cup cream and salt and pepper to taste. If you want it spicier go ahead and add a little bit more cayenne pepper but beware that this stuff increases exponentially in heat (this book is full of these fun facts!). Garnish with a big spoonful of crème fraîche***, drizzle with olive oil, crack some black pepper over the top, eat! 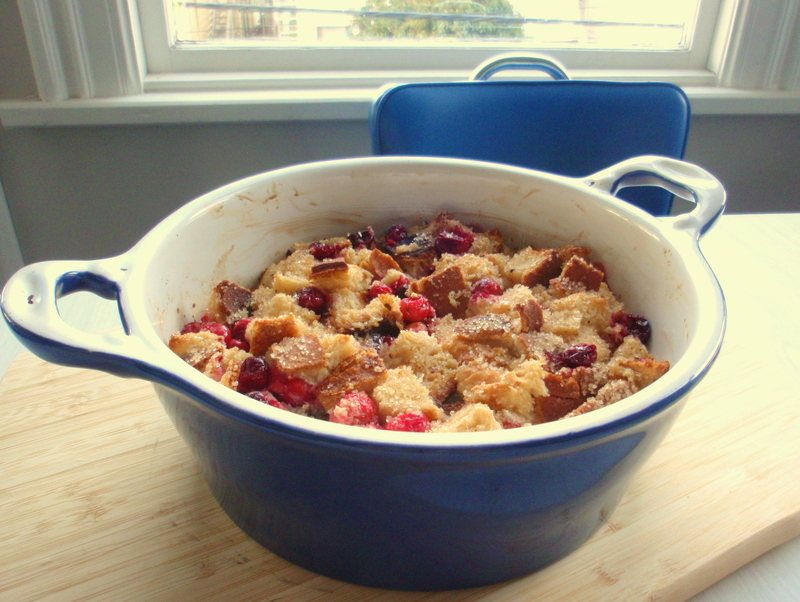 If you have any left over the next day, it is just as good (if not better, depending on the weather) straight out of the fridge. 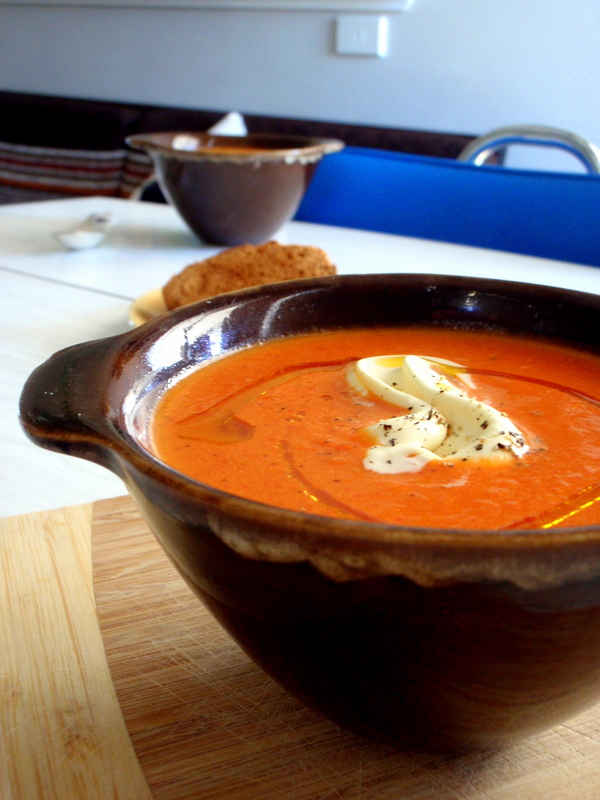 *If you’re feeling lazy you can skip this step but the silky-smooth texture of the strained soup is totally worth it. 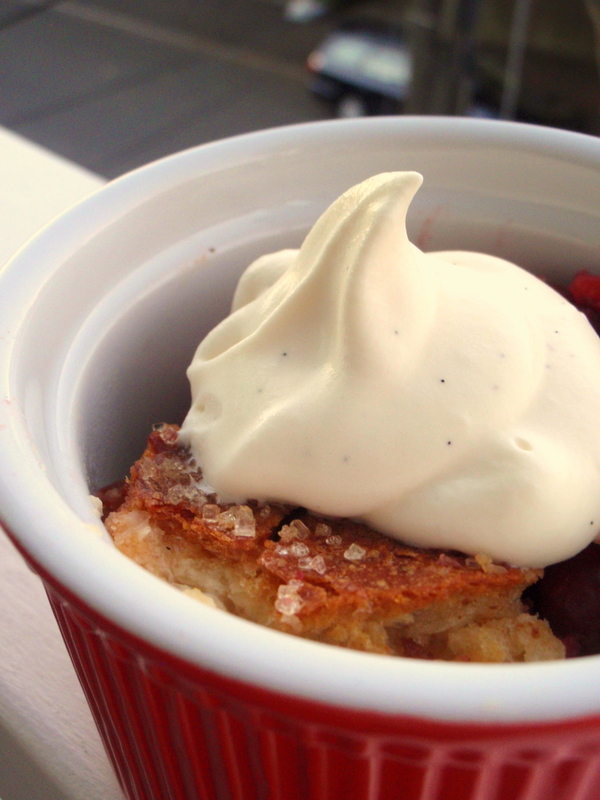 ***OK, so it’s just a garnish, but the crème fraîche definitely takes this to another level. Especially if you strained the soup. The combination of the silky-spiciness and the silky-cool-creaminess is so ridiculously dreamy. I keep coming back to write this blog post I started on Friday afternoon, then finding myself immobilised in front of the computer screen by the incomprehensibly-scaled disaster unfolding in Japan. I keep thinking of the destruction in Christchurch, and how I can’t even comprehend that, let alone what has happened to the Tohoku region. I keep remembering a family holiday in Iwate Prefecture, in particular a side trip we took to Miyako***, a sleepy little coastal town west of Morioka. The 2-hour winding train ride on this clackety 2-car train that took us through steep hills, high above a winding gorge that widened into a majestic, flat river flowing to sea. The hills blanketed in green, and then, later, the stunning limestone cliffs and rock formations rising out of the clear blue. It’s funny because I can’t remember much about the town itself, and now it’s too late to go back and remember what it was. And other place-names that keep coming up in the news carry with them faint hues of sitting on trains with my brothers, and I can’t remember much else. I find myself mourning the irretrievability of faded memories. Insignificant, selfish really, in the face of everything else. The good things have come in waves this weekend, too. First in the form of confirmation from friends and family in Japan (mostly in the Kanto/Tokyo region), that they were safe, even if they did have to walk several hours to reach their homes. Then in the form of a very delicious brunch**** I had at Monterey in Newtown. Later, in a couple hours spent following a pod of orcas around the Miramar Peninsula, one of the most joyous experiences of my life. 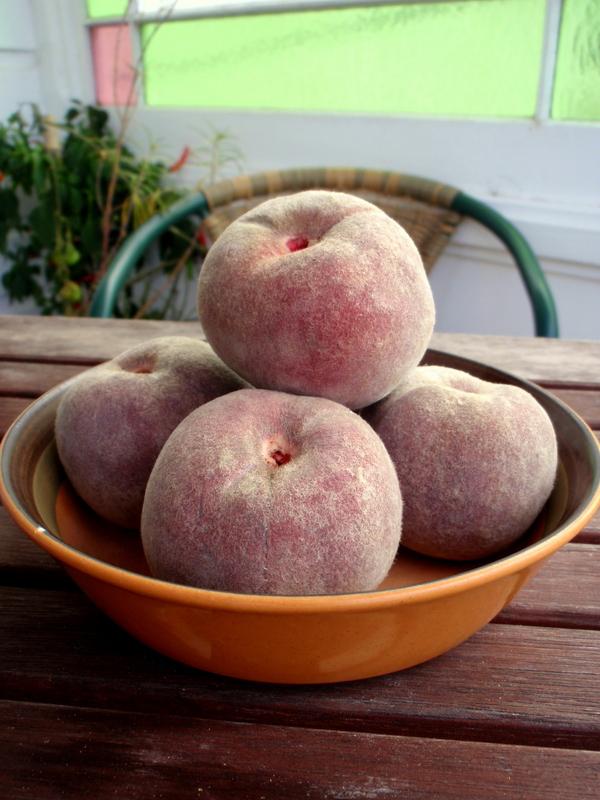 And throughout the weekend, in this bowl of blackboy peaches (the name! but hey) that ripened one by one. 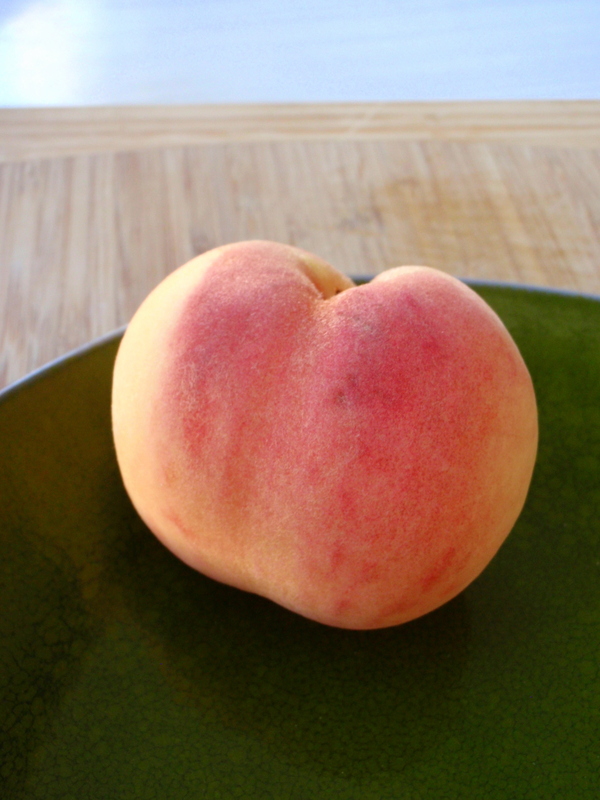 The first time I heard of these peaches was actually not until last year, when I stayed at a little backpacker’s hostel in Picton on the way to a couple days out in the Marlborough Sounds. Part of the appeal of this place was its gorgeous old-house feel, the other part the freshly baked bread and assorted homemade jams that were set out for breakfast each morning. I ended up buying a jar of blackboy peach jam to take home, enthralled by the somewhat-un-PC name and because, well, I was so excited to discover this as-yet-unheard of (by me) variety of fruit. I had no clue what they actually looked like, though, until Vanille blogged about them the other week, and I was dying to find some. Then, on Wednesday, success. Spotted a couple of boxes at Moore Wilson’s (there were some at New World as well). Picked up a bagful. And on Thursday, this custard. I wanted to keep things relatively simple to keep the spotlight (rightly) on the peach. What sprung to mind were the to-die-for cherry custard tarts my friend Rob made for a picnic earlier this summer: a sturdy pastry crust, a vanilla-bean-flecked custard filling, macerated cherries on top. But then I ate a big lunch and was a bit too full for pastry (or maybe just not in the mood), and I started thinking about this baked vanilla custard I’d had at Logan Brown some time ago. And then I saw the perfect recipe in one of my old Cuisine magazines. 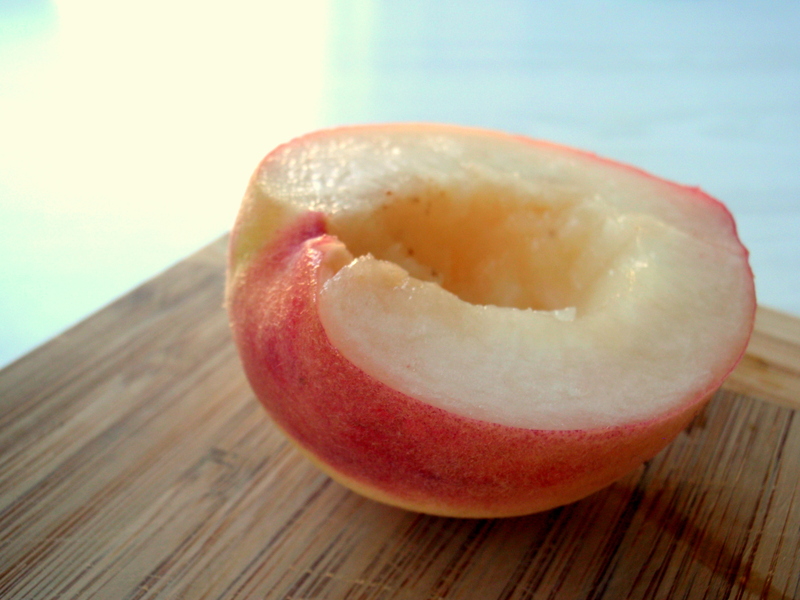 The peaches need no explanation; they’re exquisite in themselves. 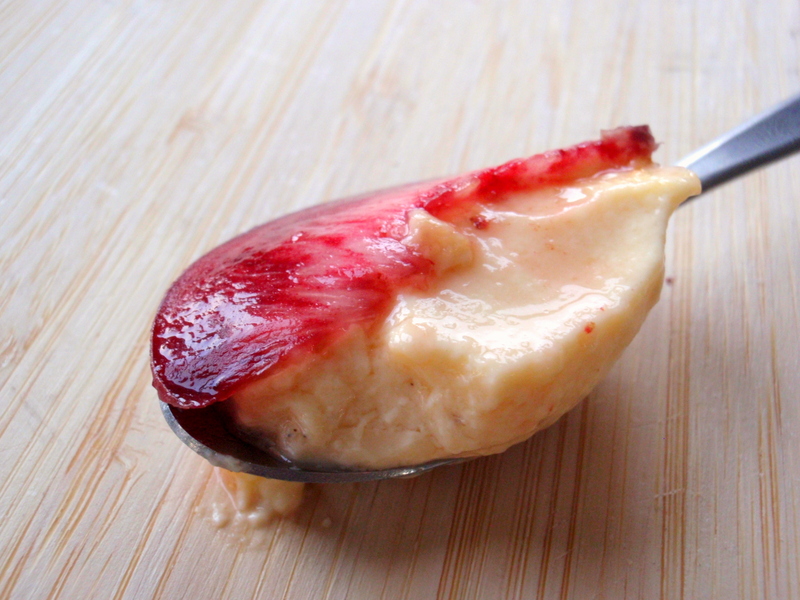 Adding a bit of sugar and leaving them to macerate gives them a bit more sweetness and juice if yours are still pretty tart, as mine were at that stage, and the peachy syrup that forms is wonderful spooned over the custard. This is one of those custards that makes you want to gasp with joy when you put a spoonful in your mouth, except you’d probably choke. 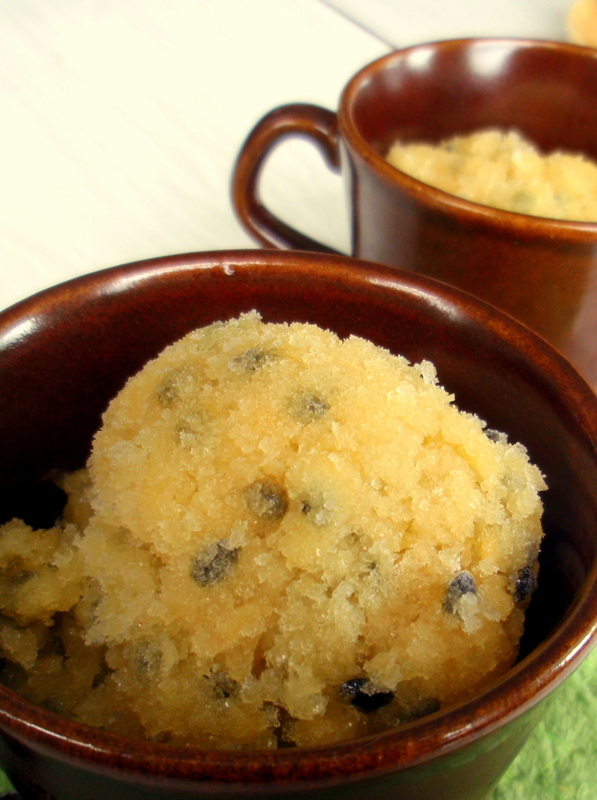 It has the most beautiful wobbly texture, at once delicate and luxurious. 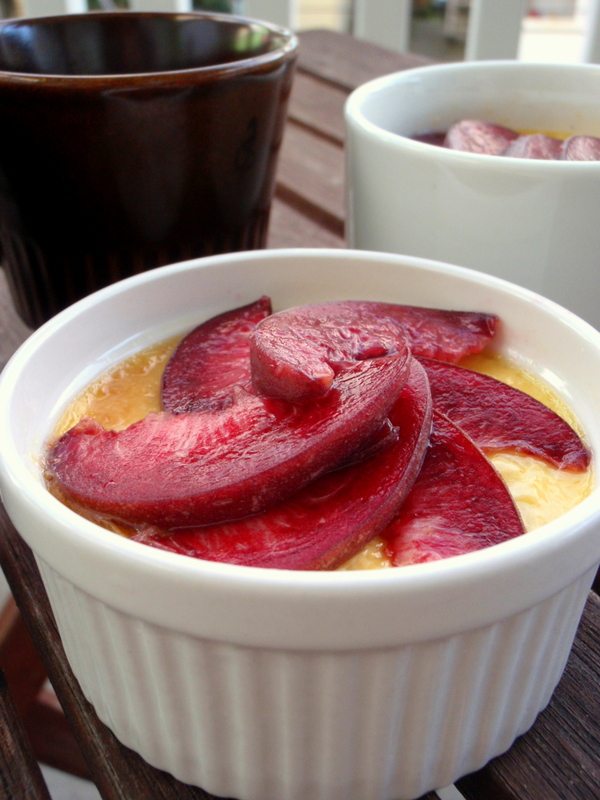 When baked custard, whether it’s unadorned or served as crème brulee or flan, reaches that just-set stage (and no more) it’s one of my favourite things in the world. Now that I think of it, this love of custard probably stems from that trip to Japan, when we spent hours on northward trains and we’d go to convenience stores beforehand to stock up with onigiri and other snacks for lunch, and the thing I ate probably more than anything else on that trip? Prepackaged purin (Japanese crème caramel). Highly processed? Probably. But so good, with that wobbly-creamy texture I adore. And because I was a kid and had the metabolism of a horse, I devoured them, train ride after train ride. There. My memories aren’t lost, after all. Though there’s so much else that is, I’m hopeful that Japan can recover some slices of normal life in the coming days. *Japan’s public broadcast station, which people have been streaming live through various Ustream channels. **Maki of the fantastic blog Just Hungry (Japanese food and recipes) has been tirelessly translating and tweeting Japanese news broadcasts for days now. Her Twitter username is @makiwi. ***I’m not posting the video of the tsunami hitting Miyako, but it’s out there, and as heart-crushing as the rest of it all. ****and a to-die-for peach iced tea! 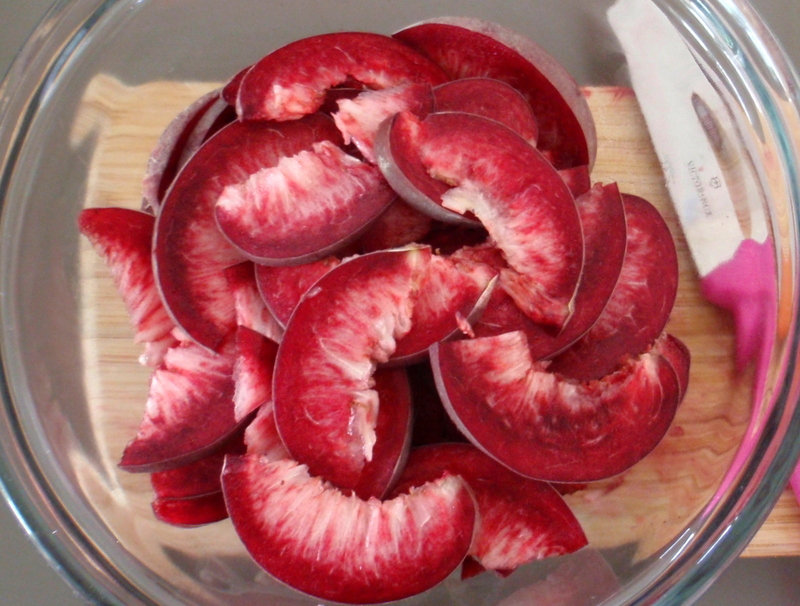 Thinly slice 2-3 peaches and set aside in a bowl. 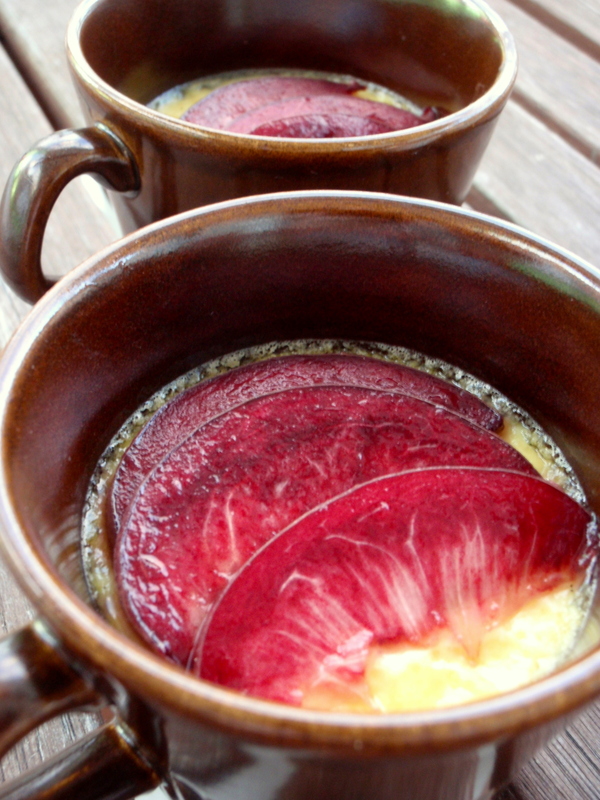 If your peaches are still quite firm and tart, you may want to macerate them by spooning over a couple tablespoons of sugar and giving it a stir before letting the bowl sit while you prepare the custard. 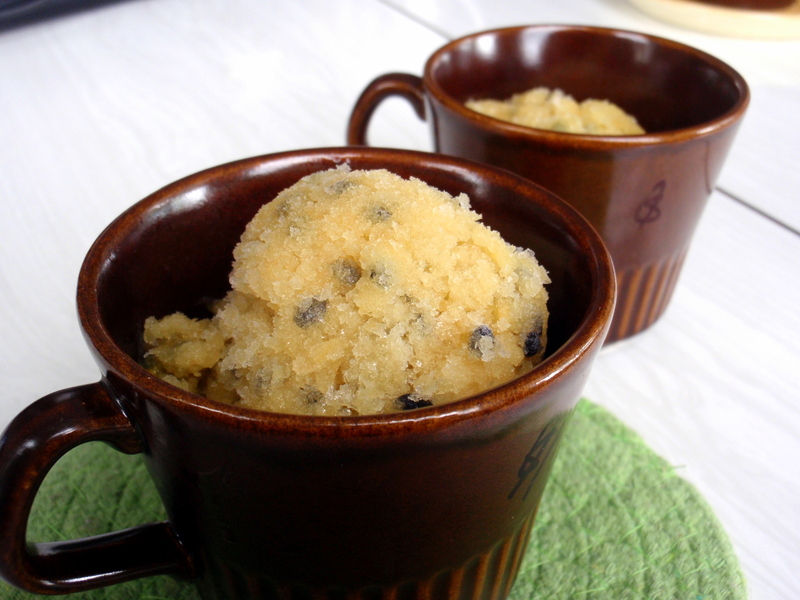 Meanwhile, split and scrape out seeds of 1 vanilla bean (alternatively you could use a teaspoon or 2 of vanilla paste but there’s something special about this dessert that deserves a vanilla bean, if you have one). Add the scraped-out bean and the seeds to a smallish saucepan with 600ml cream*, bring this to the boil, remove from heat and let it sit for about 20 minutes. Place the ramekins in a baking dish lined with a tea towel and fill halfway up the sides of the ramekins with boiling water. Carefully (do not spill boiling water on yourself!) transfer to oven. 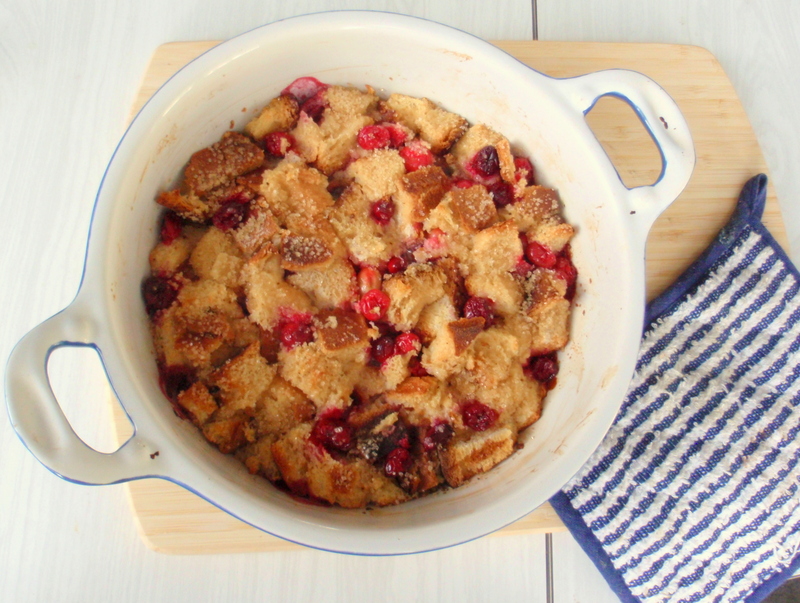 Bake for approximately 30 minutes; you’ll want them slightly jiggly. 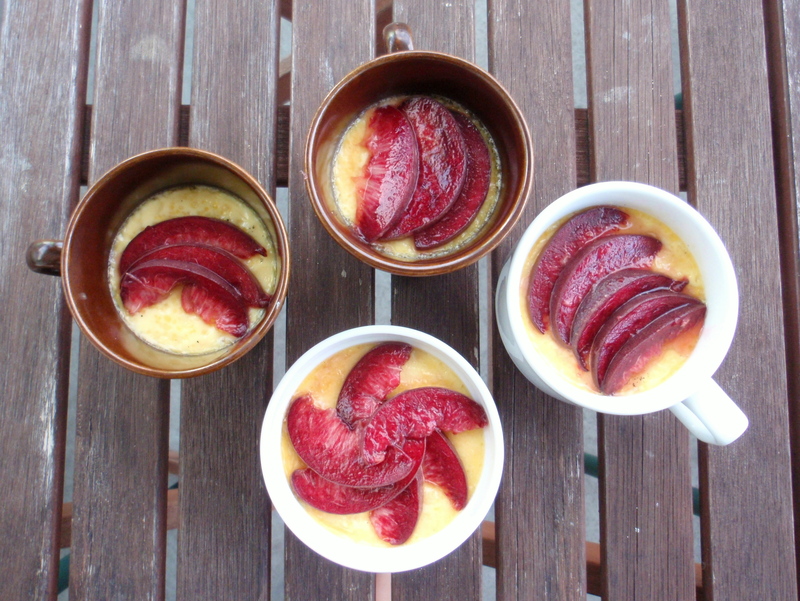 Remove the dish from the oven and then the ramekins from the dish; cool a little and top with peach slices. 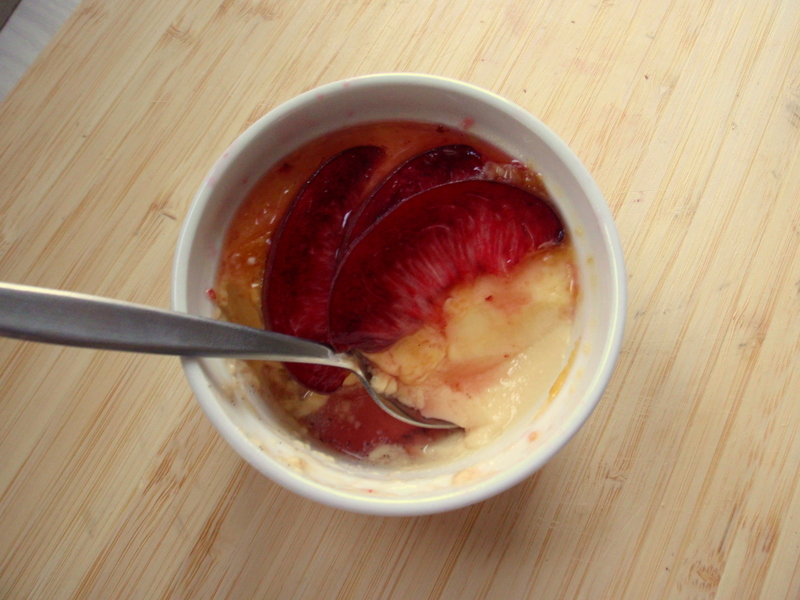 Add some of the syrup/juices from the bottom of the peach bowl if you like. It’s extra good! *I used a combination of 450ml cream and made up the rest with milk because I failed to check how much cream I had before starting to make this. It still tasted fine. **Don’t throw out the whites – you can use them for meringues, or angel food cake, or macarons, to fold into waffle batter, etc. They will keep in the freezer. 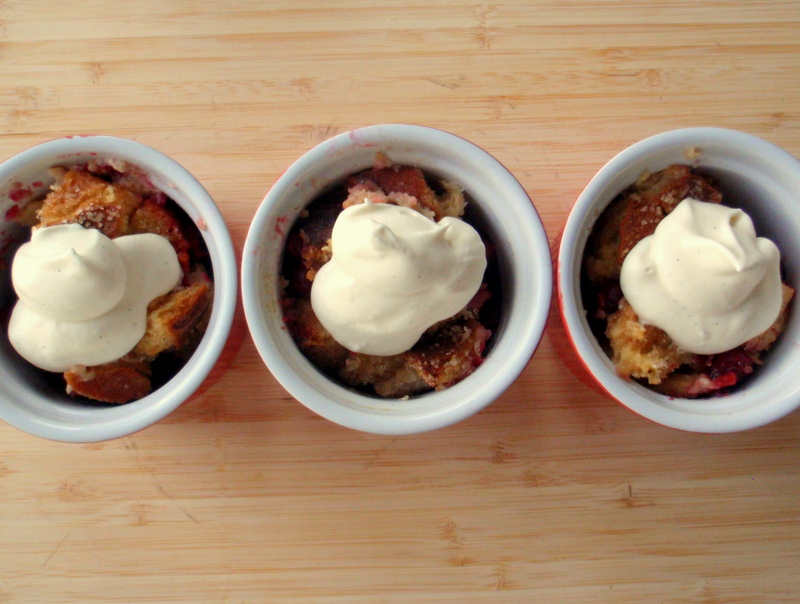 ***As you can see, I used a variety of receptacles because most of my ramekins are greater in volume than 125ml. And now I’m writing this in bed, propped up by a million pillows and making pathetic whimpering noises and generally wallowing in self-pity (it’s not just men who get the man flu! ): I have all this spare time but no desire to cook, no appetite even (!!) and the slightest bit of activity leaves me exhausted. No fun! Plus the “w” key on my keyboard has decided it’s no longer going to work, which makes things rather annoying (though I’m getting faster at CTRL+V-ing a “w” after my original plan of avoiding all words containing “w” failed). But enough moaning. I won’t go so far as to say this sorbet made me sick. I mean, that’s not fair at all, because it’s delicious and refreshing and perfect for a hot sunny day (or if you haven’t spent most of the day in a spitting southerly) and I’m sure I would have gotten sick anyway. This cold has been threatening to flatten me for the greater part of a month. But maybe, just maybe, it was the final straw, and while writing this post I’ve been eyeing these photos up warily. I’d wanted to use up the passionfruit I’d bought in a fit of excitement that were going wrinkly a bit too fast for me to eat (though generally wrinkliness is a sign of goodness). And then I remembered the saffron that the lovely Mel of treehousekitchen had given me, a souvenir from her travels in Spain, Portugal and Morocco. ** And, well, after two yellow ingredients came to mind I spotted a lemon and couldn’t not include it. First you will need to prepare some simple syrup. Heat equal quantities of sugar and water (I made a bit more than necessary and used 200g sugar and 200ml water, which made roughly 300ml of syrup) just until the boiling point, and remove from heat – the sugar should dissolve nicely into the water. Take 75ml simple syrup and, while it’s still hot, add a decent pinch of saffron threads. Let steep for about 20 minutes until the syrup is golden in colour. Optionally, stick your nose down by the cup containing the syrup and inhale the heady, earthy saffron aroma… that stuff’s more precious than gold. 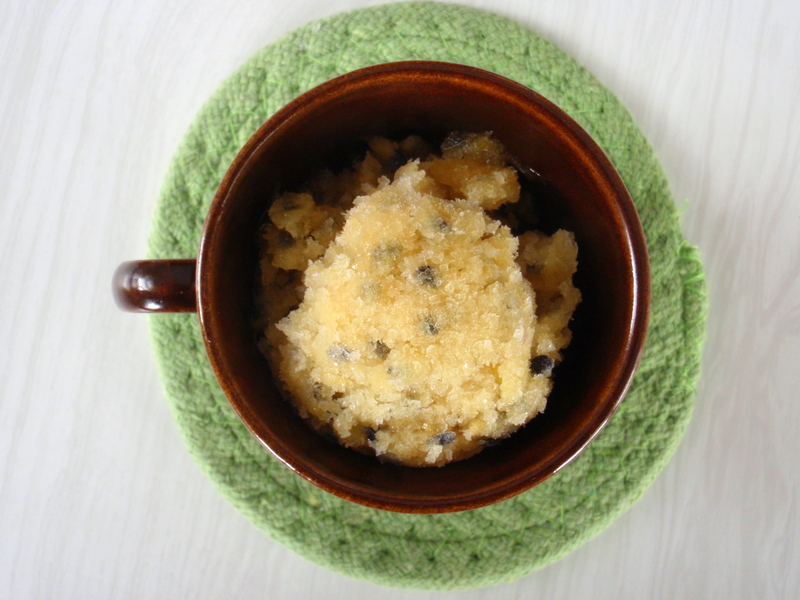 *I didn’t do this as often as I should have so the consistency, as you can see, turned out more like a granita than a sorbet, but who’s counting? **If you’re more onto it than me you could serve these with some tuiles or shortbreads or something awesome like that. *Hello winter! Not ready to see you yet! **Lately for some reason I’ve been describing the foods I eat by colour rather than name. No idea where this came from, but for example, the other night I was eating scrambled eggs, avocado and hot sauce on toast (my favourite lazy snack/meal) and had sprinkled some sweetcorn on top, and when asked later what I had for dinner my reply was “yellow, yellow, green and red on brown”. Miraculously this wasn’t met with confusion and the answer was “oh… eggs, avocado, toast, …tomato or hot sauce, and what’s the other yellow?”. Weird. I know. Feels like summer came and went in the blink of an eye. A weird, wet, muggy blink of an eye. I was going to say it still feels like summer (it’s plenty warm enough), but there’s no denying the gradual arrival of crisp mornings and cool nights, new season apples and pears slowly creeping their way onto supermarket shelves. And in this last gasp of (technically not-) summer it feels like a race to do everything you won’t be able to do for another year. Like wearing shorts, even if you have to wear a jumper on top. Going for that last, end-of-summer swim before the water gets too cold (though in Wellington it’s pretty much too cold even in summer!). Shooting hoops at Waitangi Park. Drinking Pimm’s in the afternoon sun, taking walks after dinner, eating as many berries as possible and gorging yourself on stonefruit. Each day is tinged with this subtle sense of urgency: get in while you can. And while yes, it’s true, the juicy and succulent fruits of summer are slowly making way for the crisp and autumnal, there’s still plenty of peaches left to devour. For the next couple weeks, at least. I think peaches (and, I suppose, nectarines) are by far my favourite fruit, though of course this thinking is clouded by the fact that I get really excited about whatever fruit’s in season and I’m sure this will change as soon as I take my first bite of a sweet, meltingly ripe pear, or a crisp apple (I’ve resisted thus far in a sort of denial that summer’s over). But I think that claim of favourite fruit has a little more basis than just the ohmygod-it’s-in-season-and-there’s-nothing-more-delicious mania I’m sometimes prone to. One of my favourite childhood memories is of a trip to Michigan in late August when I was maybe seven or eight, and I don’t remember much except the showers at the place we stayed smelled like rust, the beach was full of flies and – and – we visited peach orchards, eating perfect peach after perfect peach and taking more home in brown paper bags (to help them ripen). Our kitchen for the week or so afterwards had the faint, alluring aroma of ripening peaches. I always have such good intentions when I buy peaches, planning to make this or that recipe, but usually I can only get so far as rinsing them off before I find myself eating them, standing over the kitchen sink, juices running down my chin, hand, dripping off my elbow. Messy, but there’s really nothing that tastes more magnificent. 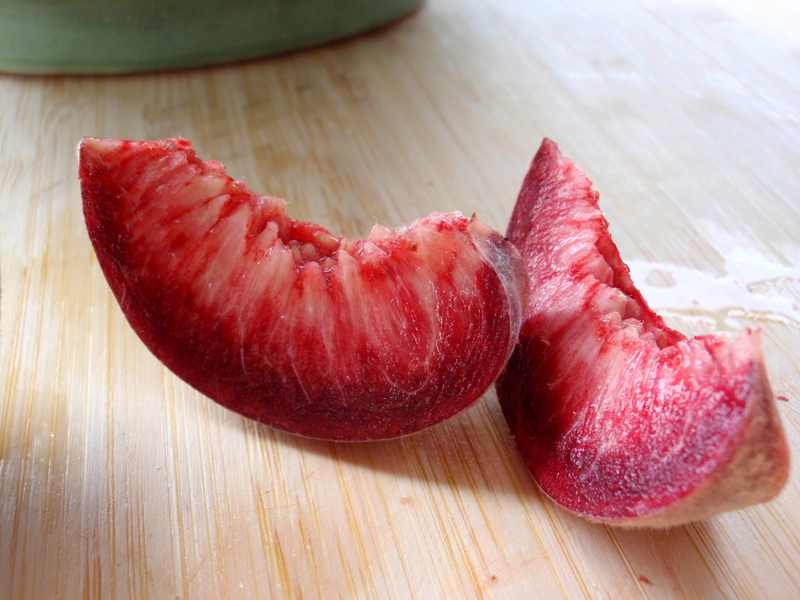 Maybe the reason I never make it past the sink is because I sometimes find when peaches are cooked they lose some of that shockingly juicy-sweet quality I can’t get enough of. 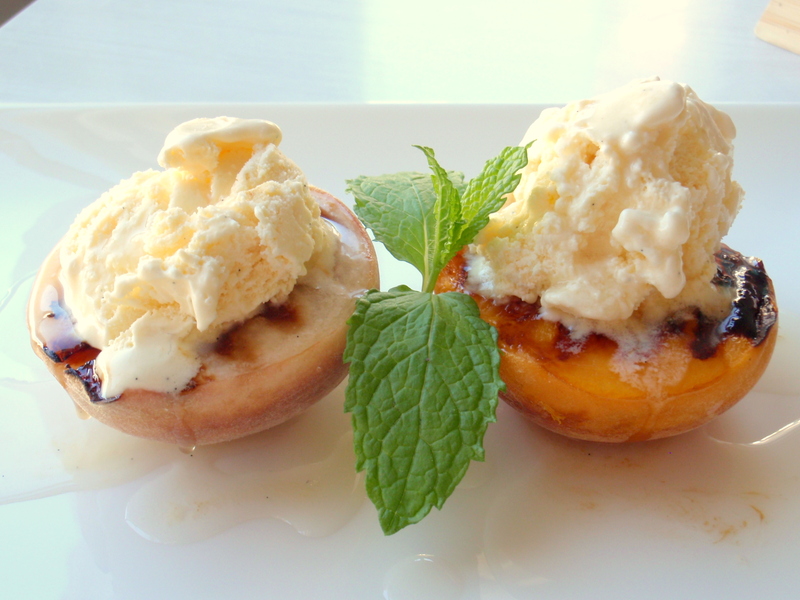 Recently, though, I’ve made an exception for grilled peaches. Somehow they manage to keep that juicy, sweet, meltingly soft quality, with the added bonus of getting all caramelised and intensely good. I served them with the lemongrass & ginger syrup I’ve been making, which I highly recommend – it adds a bit of freshness and tang to cut through the sticky sweetness. This is probably too obvious to even be a recipe (seems to be a theme in some of my recent posts, but I guess that’s what you want when it’s summer and you’d rather be outside than in the kitchen) but I wanted to post it before summer slips out of reach until the end of the year. I encourage you to try it with the lemongrass & ginger syrup if you can. Halve 2 peaches*; remove the stones. ** Place on a hot BBQ, grill pan or place under the grill in the oven**, cut side facing the heat source. Grill for 5-10 minutes (depending on your grilling implement) until the surface is caramelised and the peach halves are tender and warmed all the way through. 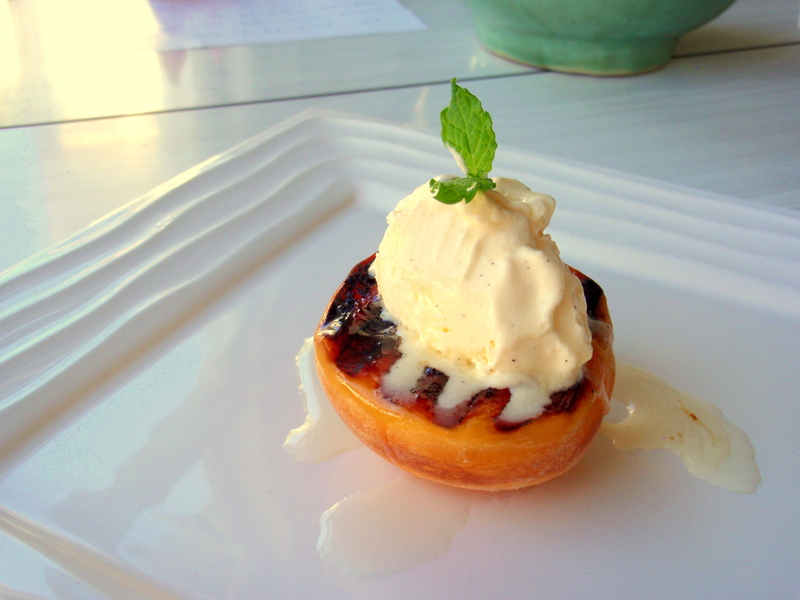 Top with vanilla ice cream and a liberal pour of lemongrass + ginger syrup (recipe here). **** If you garnish it with a mint sprig it’ll be extra pretty (and it goes well with the other flavours). 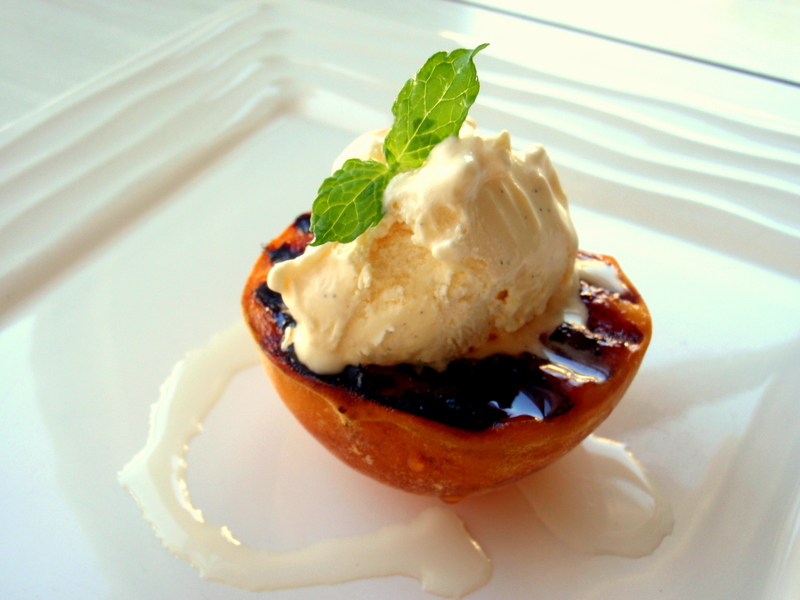 Watch as the ice cream melts into the grooves of the hot peach and drips down the sides and forms molten pools of amazing with the syrup. Or just eat. 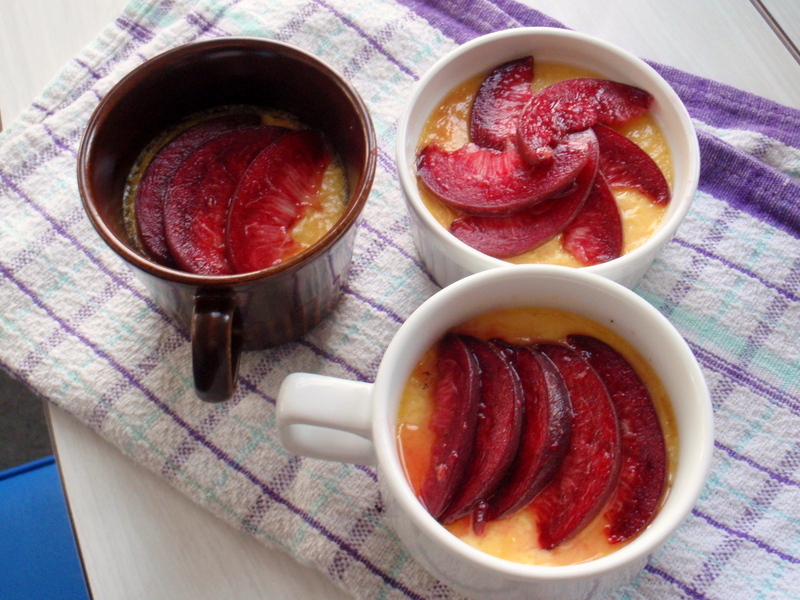 *For this I used both white-fleshed peaches and Golden Taturas. Both were delicious. 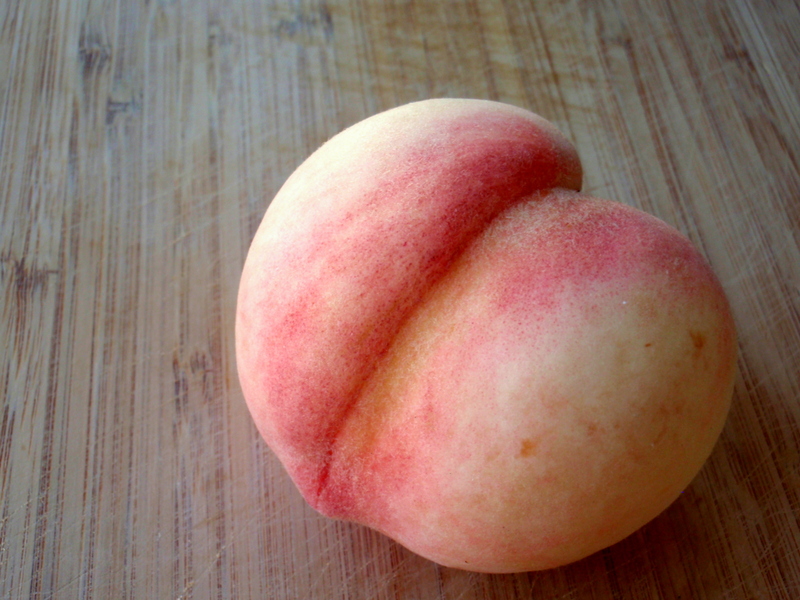 Use any peaches you like. Nectarines will also do. **If your peaches are super ripe, you shouldn’t need to do this, but if they’re a bit firm or you’re keen for more caramelisation (OK, who isn’t) you could sprinkle the cut side with a bit of demerara sugar before grilling. I didn’t do this, and found it sweet and caramelly enough. ****I suppose you could also make some other sort of glaze, or use another syrup, or even scoop a fresh passionfruit over the top. 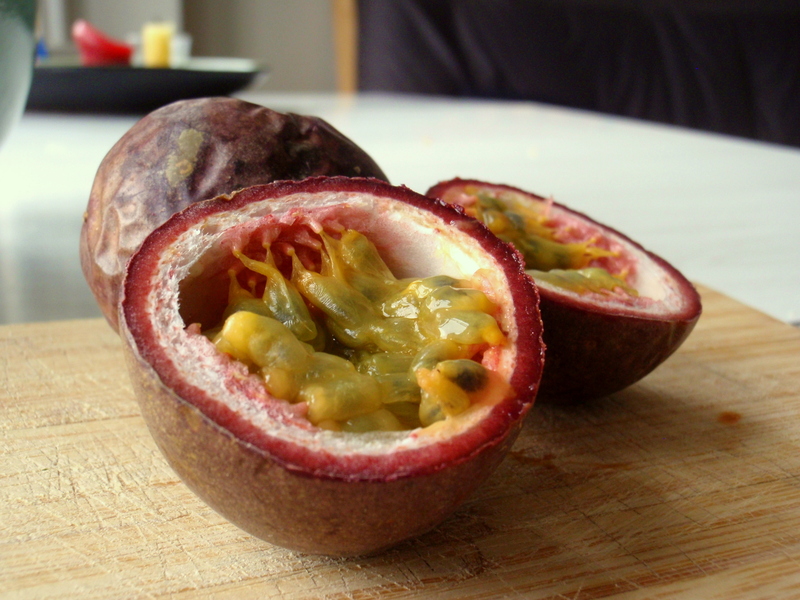 Which reminds me, passionfruit…! On Tuesday last week I was headed to a potluck dinner and had planned to make something awesome with tomatoes inspired by the latest Cuisine magazine. Instead I found myself, a half hour before I was due for dinner, standing outside Moore Wilson’s in a crowd of people staring open-mouthed at the television screen. Up till that point I had somehow weathered the day, watching the events unfold, making contact with loved ones till I was sure all family members in Christchurch were accounted for, but standing there among a group of strangers all sharing the same horror and disbelief changed something and suddenly the bag of tomatoes I was carrying turned to lead, my face crumpled into some unrecognisable shape and I knew I had to get home before someone saw me cry so I grabbed my bike and pedalled out into the drizzle, failing to even pretend that my cheeks were wet from the rain. Now a week has passed. Though I can’t even begin to fathom what Cantabrians must be going through, for the rest of us it’s been a week of emotional extremes, from relief at learning that loved ones were safe, to heart-stopping panic at remembering a friend or acquaintance had just ventured South, to sheer despair and sadness at hearing the stories of those who weren’t so lucky, at seeing the images of a beloved city reduced to rubble. There’s been hope, too, in images like these and in seeing the massive collective effort New Zealanders (and plenty of people overseas) have put in to band together and support Christchurch. **** I’ve never seen anything quite like it. It’s awesome. The other thing that seems to have sprung out of the earthquake, at least in Wellington, is this hypervigilance I (and plenty of others I’ve talked to) can’t seem to shake. The good thing about this is I’ve got my emergency kit sorted, but still. Every time I go outside I find myself eyeing up building facades and power lines, glass windows, with this sort of half-wary mistrust. At work my mind keeps wandering back to how quickly I could get under my desk if the earth started shaking, and if my desk would really do me any good. Part of this comes from living on a major fault line, the other from reading stories of narrow escapes and those who weren’t so lucky; it seems like in every story three seconds could have made the difference between life and death. And that got me thinking about whether the whole freaking-out-about-The-Big-One thing is futile. I mean ultimately, if you break it down, life or existence or whatever comes down to this: the goal is to live, until you die. Maybe also reproduce, if you look at it from an evolutionary standpoint. I guess it’s taken a big event like this to make me think about the fact that death happens, can happen, at any time. It feels cruel, but in the end, there is no cruel, no kind, if you’re looking at the bare elements of life. Everyone lives, everyone dies. Some lives are shorter than others; they’re all lives nonetheless. But being human we can’t just break life down to biological standards. We love and laugh, and weep and mourn, and losses cut deep and we can’t ignore the emotions that so inextricably link us to the events we experience, the people we interact with. So the best thing that I’ve been able to come up with in the last few jumbled days is a resolution to exist, to enjoy, to cherish others. On the day in question the potluck I was headed to was for a dear friend’s birthday, something I wouldn’t miss for all the earthquakes in the world, and not just because when tragedy strikes you’ve got to surround yourself with your favourite people. But I still had a bag full of tomatoes and not much time or inclination to cook. I had even less inclination to turn up to a potluck empty-handed. Which is how I got to making this salad. When you’re feeling raw and cut up you may not want to eat something raw and cut up (my first instinct is to reach for a bowl of mac and cheese) but there’s something cathartic about chopping vegetables, and it was sure as hell easier to put together this simple salad than to think about cooking something at that stage. And luckily it’s that time of year when tomatoes are at their fattest and juiciest and you don’t need much more than a few simple accompaniments to put together something delicious. 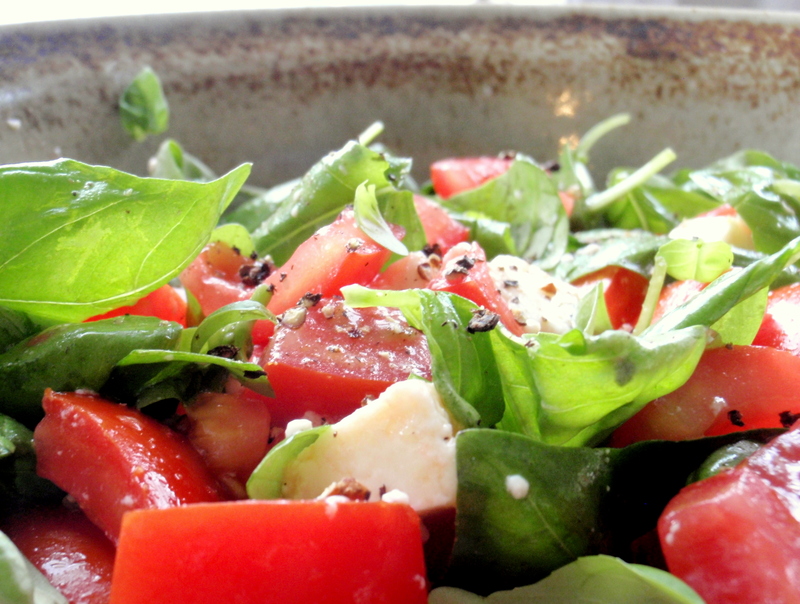 This salad is roughly based on the classic Italian insalata caprese but with fresh ricotta instead of buffalo mozzarella (mainly because that’s what I had in the fridge). I’ve provided quantities to serve 2-3 as a side dish but feel free to adjust as necessary. If you want to make the pasta (recipe further below) the next day, maybe double the recipe so you have enough. Chop 3 ripe tomatoes (more or less depending on size/type of tomato) into chunks; put in a bowl along with any juicy bits that may have seeped out onto the cutting board. 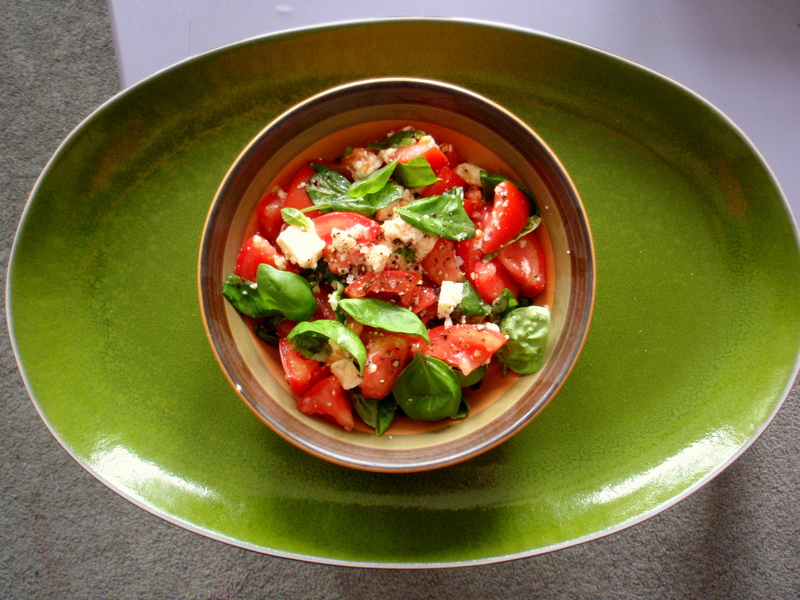 Add a generous handful of fresh basil leaves* and pieces of firm, fresh ricotta**, pour a glug of olive oil into the bowl and season generously with good-quality sea salt and cracked black pepper. A drizzle of white balsamic wouldn’t go amiss, though at this time of year the tomatoes can easily hold their own with just some salt, pepper and olive oil. 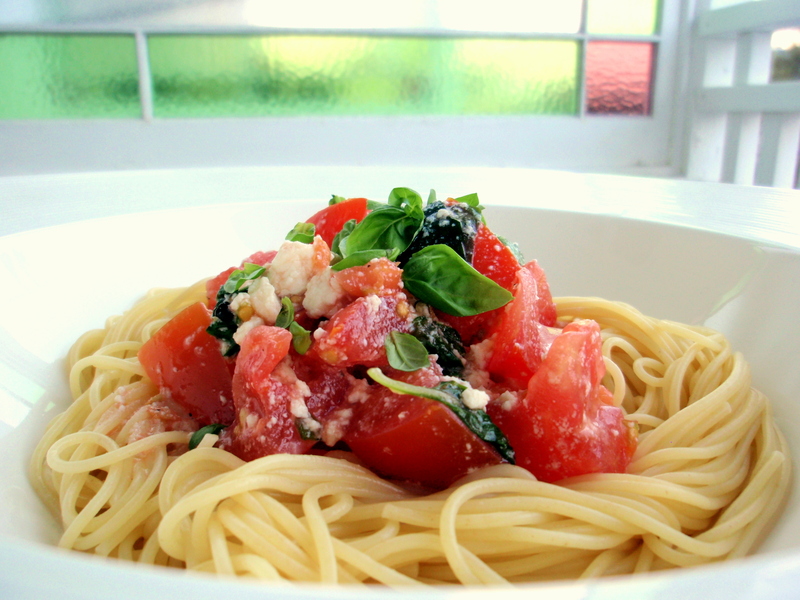 Toss, taste, adjust seasoning as necessary, garnish with a few more basil leaves, serve. This salad could easily accommodate chunks of avocado, or cucumber, or plenty of other summery bits and pieces – but for now I’ve kept it simple. *torn if they’re quite big, but don’t chop them as they bruise easily. 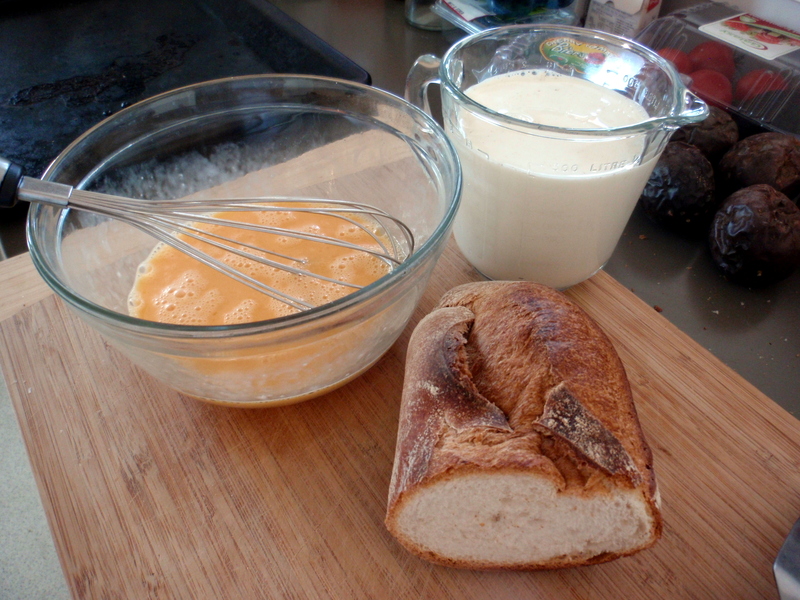 **for this you’ll want to use ricotta that’s quite firm and sliceable. I used Zany Zeus but if you can only find the creamy variety in pottles you could also make your own (super easy and cheap) or else just make it a caprese salad and go for fresh mozzarella. The key is bits of fresh white cheese. 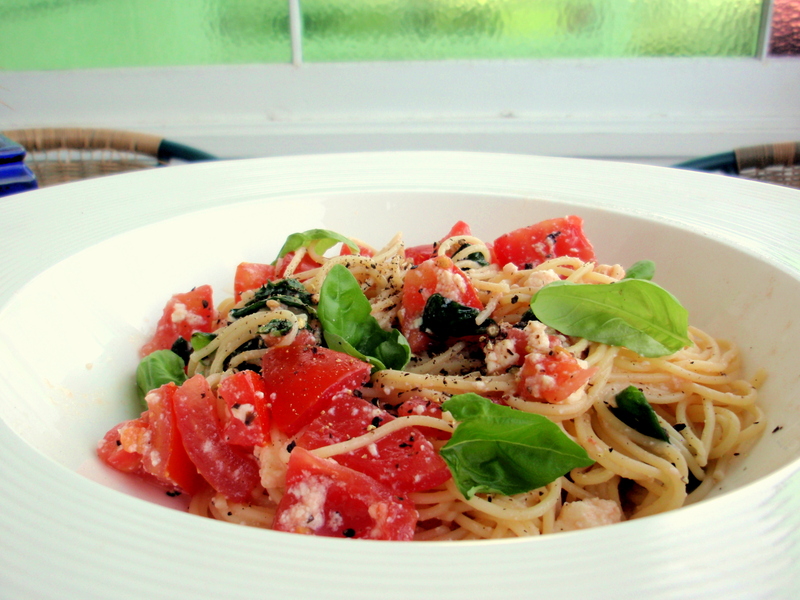 Take the salad above* and toss with 250g** cooked vermicelli, or whatever pasta’s handy. 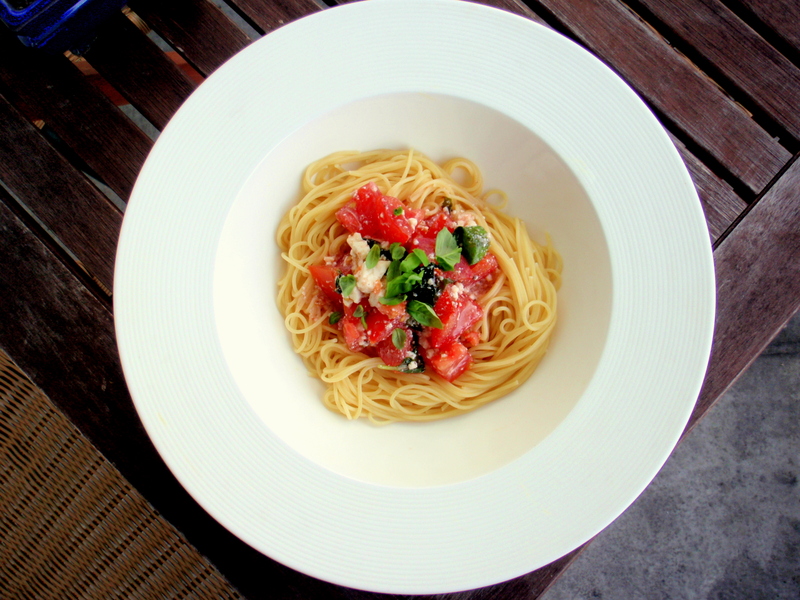 I like it with vermicelli because the thin strands get coated with the tomato juices and flecked with ricotta and seem to carry the delicate fresh tomato and basil flavours quite well, but spaghetti or bucatini would work fine, too. 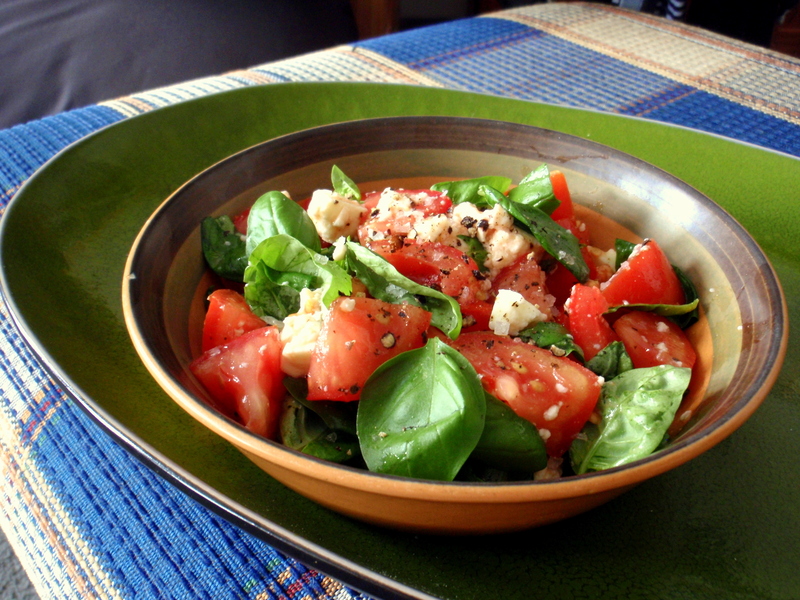 Sprinkle with a couple of freshly torn basil leaves (especially if you’re making this the day after making the salad – the previous day’s basil will be dark green and wilted), crack some pepper over the top, eat while hot. *this is best made with next-day leftovers because the salt will have drawn out the juices from the tomatoes and penetrated the ricotta chunks, thus giving you extra liquid to toss the pasta in, but if you’ve just made the salad and it seems a bit dry you could always add a bit of the pasta cooking water or a bit more olive oil. **more or less, depending on appetite/preference. ****PS. it was probably more for my own good than anything else, but I’ve been doing a bit of baking for the “bring and buy” fundraising stall at the gorgeous little garden store Grow From Here at the top of Cuba St. It’s going on all week and a gold coin donation will get you baking, clothes, old vinyl, handmade candles, etc. On Saturday morning I hung out with Laura of Hungry and Frozen and her counterpart Tim and Kaye, who runs the place and had set up a space for the stall, and it was a lovely, laid-back morning gathering coins and being surprised by the generosity of everyone who stopped by. Laura’s got a pretty good rundown of the day on her blog, go check it out (I couldn’t have said it better, really).